The author of this blog has been condemned to pay 6000 Euros to the manager of the Jornal da Madeira, Rui Nobrega as a result of a civil suit. The case was brought against the Garajau newspaper for a report on the criminal investigation carried out by the Investigative Police on the performance of Rui Nobrega when he was acting as a bankruptcy executor. The investigation found that contrary to regulations, Nobrega failed to open an account in the name of the creditors, using instead the personal account of himself and his wife - a judge. The bankrupt company, called Masiluz, belonged to one of Jardim's chronies, Manuel da Luz, who regularly accompanied Jardim in his summer banquets (paid by public and private companies), known as the 'summer university'. Nobrega sold part of the goods of the bankrupt company back to a company belonging to Manuel da Luz's son in law, at prices which did not benefit the creditors. 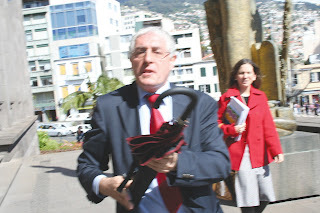 Nobrega was acquitted by the judge before the trial phase - he claimed not to know the connection between the two parties. The Investigative Police was reportedly unhappy about the acquittal, but had no power to appeal the decision. The Court found that the Garajau article was slanted against Nobrega, raising questions as to his acquittal. In its few years of existence, the Garajau satirical newspaper was target of dozens and dozens of court cases, which all added up, asked for close to a million Euros in compensation. Most of the cases were thrown out or dropped. But the Garajau still had to pay thousands of Euros in judicial fees. Many of the cases were brought by members of the Regional Government and were paid for by the taxpayer. The Garajau was acquitted in all the criminal suits that went to Court, except one case which is pending at the European Court of Human Rights. One case was dropped during the trial phase itself when witnesses called for the prosecution divulged information that could have lead to self-incrimination. Rui Nobrega has been the subject of various investigations and has been very gently dealt with, not to say protected, by the Public Prosecutor's Office. In 2009, the Court Auditors sent their report to the Public Prosecutor's Office in order that they invstigate the 'fake business' of the Jornal cover price. The Jornal has a cover price of 10 cents, but is distributed for free. The distributor 'bought' the Jornal and then was paid handsomely for distributing the Jornal for free. The 10 cent cover price was and is a ruse to recieve the official publicity of the municipalities, which by law can only be made in paid newspapers. The Public Prosecutor's Office, after two years of so-called investigation, shelved the case saying that the 10 cent cover price had no juridical relevance ...omitting any reference to the law that prohibits official municipal publicity in freeby newspapers.